Pohjola Non-Life Insurance Company Ltd. The present-day methods for calibrating the level of magnetization ac-yokes produce in the material and, consequently, the probability of the magnetic particle testing method to delineate discontinuities, suffer from intrinsic deficiencies. 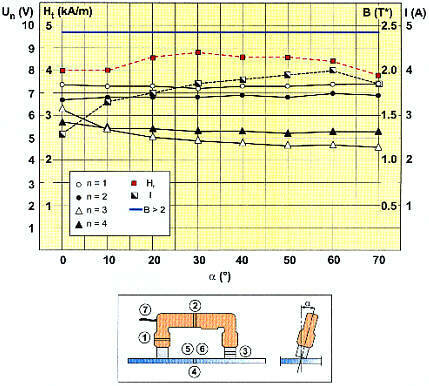 In yoke magnetization the calibration is hard because of the non-linear behavior of the ferromagnetic materials to be tested, and also because there is no unambiguous way of presenting magnetizing requirements. The most used calibration methods, above all the tangential field strength (Ht) and lifting force measurement, are indirect and give reliable results only for well-known materials and for component geometries such as straight plates. The paper presents practical comparisons of contemporary indirect (Ht-, and the current measurement method as proposed by Walther) and a direct measurement method (induced surface flux T*-measurement) with the results achieved with the twin induction method developed by the author. The twin induction method gives an indication of the contact between the poles and the material to be tested, and thus also monitors the effective flux entering the material. The results show that this new method has advantages compared with existing methods especially when testing components with complex shapes. As far as the number of items is concerned magnetic particle inspection (MPI) is the most frequently used NDT-method next to visual inspection. MPI is widely used because the physical principle of leakage flux formation utilized by the method functions straightforwardly leading to a high probability of detecting surface breaking and near-surface imperfections in components of extremely varying geometries and sizes. The bulk of the individual items tested using MPI represents highly stressed crucial components which are typically used in the automotive industry, where the magnetization is predominantly performed using current magnetization or flux magnetization produced by a measurable current. MPI is also used extensively for manufacturing and in-service control of structures that cannot be moved, and here yoke magnetization is predominantly used. In MPI the practical calibration of the method, both on site and for stationary units, is reduced to the evaluation of three multiparameter functions. These are the level of magnetization, the functioning of the magnetic particles themselves and the level of illumination. This paper deals with the first and most important of these - the calibration of the magnetization level - which is clearly more complex in nature compared with the two other functions. In current magnetization the level of magnetization can normally be fairly unambiguously controlled by measuring the applied currents. In yoke magnetization the evaluation of the level of the magnetization is difficult - even impossible - to measure directly on site. Thus indirect measurement methods have to be utilized. Requirements presented in internationally acknowledged standards and specifications give an idea of contemporary methods for calibrating. The requirements referred to include tangential field strength measurement and lifting force measurements. They also include requirements on the flux level even though the measurement method is not stipulated, as well as flux levels relative to the saturation flux level. Finally, requirements for performance tests utilizing artificially made test blocks are also referred to. In fact, some standards include the best method of calibration, which is to use actual products containing defects with known dimensions and locations. 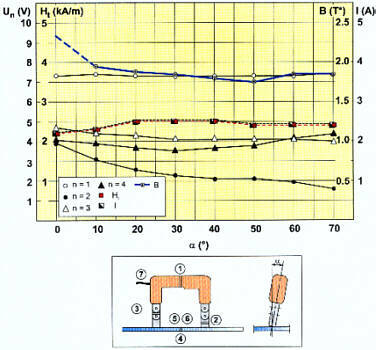 The paper presents briefly the most important indirect and direct measurement methods used in yoke magnetization. In the practical tests, results from using the most known indirect measurement methods i.e. Ht -measurement, the current measurement method as proposed by Walther and the twin induction method are being compared to the surface flux measurement method, which is a direct method. In the tests an induction measurement performed directly from the object is also used as a reference. The oldest way of calibrating a yoke is to measure its lifting force. This is naturally an indirect measurement method, which shows that the force is strong enough for a specific object. This would imply that the magnetizing ability is good enough for another object with another geometry and permeability. The American standards and norms have traditionally recommended the lifting force measurement as a calibration method. In the CEN-standardization work there has been vivid discussions concerning this topic. According to the European view the yoke is not a lifting device especially when using AC current. According to the CEN MPI- standards, DC may only be used when this is specially agreed upon between the contracting parties, and the sole use of lifting force is not justified . This is due to the fact that the waveform of the current used is sometimes heavily distorted. 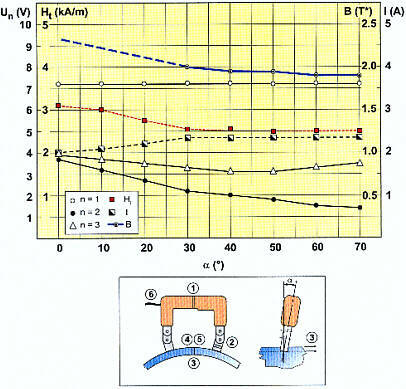 Moreover saturation effects in the steel and hysteresis as well as geometry considerations make it difficult to relate the lifting force to the magnetizing ability directly. Nevertheless, the test is attractive in its simplicity, and it is hard to argue against the fact that a yoke with a relatively high lifting force would not have a better magnetizing force than one with a respectively lower force. Hence, the CEN-equipment standard (prEN ISO 9934-3) has made a compromise in that it specifies the yoke to be measured using Ht -measurement, and a lifting force measurement can be performed as an on-site in-service check of the magnetizing ability. The requirement is hereby proposed to be 44 N.
There are several devices constructed of a ferromagnetic material with one or more interruptions in it to simulate an air-filled discontinuity. The best known are the German "Berthold -cross", the American ASTM "Pie gage", the British" Castrol flux strip" and the French "AFNOR no 2 Ring". However, flux shunting indicators pick up stray flux from the air more effectively the higher they are or the higher their relative permeability is compared with that of the underlying material to be tested. Therefore, the indication ability can be fully misleading if they are used in conjunction with yoke magnetization. In current magnetization they work fairly well due to the different type of field exitation. The use of most of the artificial calibration pieces merely gives a good indication of the direction of the magnetizing and very little information about the prevailing flux density at the surface to be tested. Nevertheless, the use of this indirect method as well as other indirect methods is to be encouraged and experience has shown that using them has mostly been successful in the past. One only has to realize the pros and cons of the respective method. As a byproduct the use of artificial pieces also gives a notion of the fact that the illumination is good enough to delineate indications and that the magnetic particles themselves work satisfactorily with or without the use of contrast paint. This fairly novel measurement method has been produced by Castrol Ldt. The method utilizes a double Chattock bridge in order to nullify the tendency of the first bridge to include the e.m.f. induced by the magnetic field above the surface. According to D. Lovejoy, the developer of this measurement method, the effect of difference in permeability between the core of the flux bridge and the test piece can be reduced to a minimum by the choice of material for the core. At BAM the feasibility of this method has been studied for steels of different permeabilities ( Stadthaus et al., 1994) and the results presented indicate that the results are more or less just as falsified as for Ht-measurements. In Germany a method has been developed mainly for underwater magnetic particle testing, where the calibration is done by tilting the yoke in order to accomplish an incomplete contact of the legs to the material to be tested ( Walther et al.,1992). When doing so, the inductance of the yoke goes down, and the current increases to a maximum at around a tilt of 45 degrees. By registering (normally computerized) the current used, first for a transformer plate and then for the object to be tested, a calibration of the yoke magnetization is achieved. This method is one of the calibration methods evaluated below, where it has been applied for regular types of yokes and not solely for the special type of underwater yoke i.e. a yoke with flexible legs filled with an amorphous magnetic material, it has been used with. If a yoke is instrumented with three induction coils and the induced fluxes in the legs are compared with the initial flux produced in the coil (or in the two coils), deductions can be made of how great a portion of the produced flux actually enters the test piece. Hereby, the material below the leg of the yoke works as an antenna for the flux and the comparison gives a good evaluation of the useable flux induced into the work piece, and hence facilitates a means of calibrating the magnetizing ability of the yoke. The author has patented the method and an applied measuring ring, and has called the method the twin induction method. As shown below, results using this method are compared with those of two other indirect methods i.e. the Ht -measurement and Walter's current measurement method as well as with those of the surface induction ( T* ) method which is a direct calibration method. Dr. C.Edwards together with Prof. S. Palmer developed a novel type of magnetic flux meter at the University of Warwick in the mid- 80's. The meter uses a two-tip transducer and picks up an induced voltage, which is a function of the skin depth of the alternating current, the distance between the tips (not variable) and the time derivative of the magnetic flux in the material. It gives the result in a unit called T*, which is a function of the conductivity and the permeability of the material, and represents a conservative evaluation of the real surface flux density. As the value measured is the induction from only one coil, the voltage produced lies in the microvolt region, and even an oxide film on the steel surface influences the accuracy of the measurement strongly. Thus the main drawback of this method is - in addition to a somewhat controversial way of calibrating the meter - that the electrical contact for facilitating a pick-up normally requires grinding of the area for the measuring tips. Since the surface of a test piece can be ground under laboratory conditions, the method gives good and physically plausible results. Regardless of the fact that the accuracy of the absolute reading is debatable, the measurement method gives very useful information on the flux distribution in an object. In the mid- 80's also Magnaflux developed a new type of meter with the brand mark MPL 101. The instrument utilizes the fact that the impedance of an eddy current coil changes very little until the maximum permeability of the material is reached. When calibrated the meter is supposed to give the acceptable levels for magnetization in per cent compared with the calibration value which is achieved using a slot with a depth of approximately 0.5 mm in a calibration block. The main shortcoming of this method is that the maximum permeability varies too much from material to material in order to facilitate a working calibration. Additionally, the machined calibration slot gives another type of response than a real crack does (Aastroem&Hansen, 1989). In some practical test series the endeavor is to find out whether the calibration methods used display a plausible correlation to the increasing incomplete contact of the poles and to evaluate if the registered differences are great enough to be utilized for a calibration of ac-yokes. In Figures 1 to 5 (Aastroem, 1999) results of three indirect calibration methods i.e. Ht -, Walther's- (D I/I) and the twin induction method and one direct surface induction method ( T* -measurement ) are compared with those of an induction measurement performed directly from the object to be tested. When the magnetic flux is measured directly from the material, this gives the best correlation to the level of the magnetic flux induced into the component. Fig 1: The current measurement of calibration ( Walther's "tilting calibration") compared with Ht, -T* -, and the twin induction measurement methods. The measuring locations of the encircling coils [1- 4]. 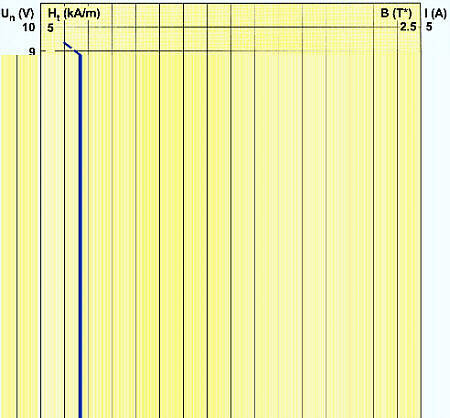 The induced voltages ( U1- U4 ), the field strength measurements ( Ht at 5 ), the induced surface flux densities ( B at 6 ) and the current used ( I at 7 ) as a function of the angle of tilt ( a ). The yoke is a 2-coil Tiede 220 E, having a lifting force of ~ 150 N. The yoke was used without articulated legs. Test specimen: a plate ( 500 mm x 500 mm x 10mm; Fe52 ). The Ht -values were measured using a MP-3 Z meter by Interflux, the T* -values using a DSF-1 meter by Par Scientific and the current was measured using a clamp-on meter by Kyoritsu. Number of windings in encircling coils: 30. Fig 2: The same arrangement, specimen and meters as in Fig. 1 except for the fact that now the yoke was equipped with 2-joint articulated legs and an additional encircling coil at the upper joint of the articulated leg. With the legs attached the yoke has a lifting force of ~ 80 N. The legs were kept straight during the tests. 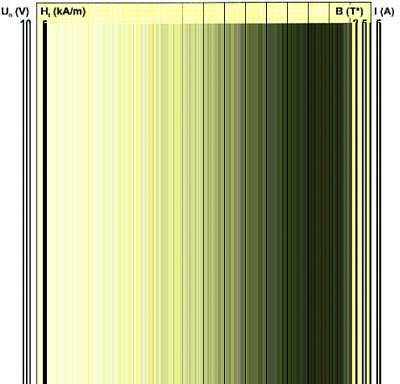 Fig 3: The same arrangement, specimen and meters as in Fig. 1 except for the fact that a 1-coil yoke of the type Parker B 300 S was used having a lifting force of ~ 100 N. The yoke has articulated legs with two joints. The legs were kept straight during the tests. Fig 4: The same arrangement, specimen and meters as in Fig. 3. The specimen is a part of a pipe (f 500 mm; length: approx. 600 mm; width: approx. 400 mm; s= 20 mm; 10CrMo910). Here Walther's "tilting calibration" was performed with the yoke transverse to the pipe. The encircling coil (coil 3) was wound around the specimen and taped to the inside of the pipe in the length direction of the pipe. Fig 5: The same arrangement, specimen and meters as in Fig. 4. Here Walther's "tilting calibration" was performed parallel to the pipe. The encircling coil was wound around the specimen in the transverse direction of the pipe. In Table 1 an approximate subjective evaluation of the test results is summarized, and the results are graded into four groups. The criteria has been the applicability of the method for calibration in such a way that "ok " means that the method would work, " ~ ok " that it would work fairly well, " ~ no " indicates that it would not in this case be easily applicable for calibration, and, finally " no " that the method falsifies the results. Fig. Object	 Yoke	 Ht	 B*	 DI/I	 T.I. non-applicable = no and outside measuring range = ?. Aastroem, T., 1999. Monitoring the level of magnetization in AC-yokes by utilizing the twin induction method. Doctoral thesis. Acta Polytechnica Scandinavica. Mech.Series No.135. Espoo.128 p.
Aastroem,T.& Hansen H., 1989. Comparison of different field strength measurement methods. Proc. of the 12th WCNDT, Amsterdam. p. 382-84. EN 10084. 1998. Case hardening steels. Technical delivery conditions. European Standardization Organization. 35 p.
prEN ISO 9934-3.1999. Nondestructive testing. Magnetic particle testing - Part 3: Equipment. European Standardization Organization. 16 p.
Stadthaus, M., Haeger, H.& Kruse, J., 1994. Measurement of the magnetization in magnetic particle testing. Proc. of the 6th ECNDT, Nice. p.689-93. Walther, K.G.,Walther, R.G.& Watt, A.M., 1992. Computer monitoring of coupling in magnetic particle testing. Materials Evaluation 50. p.1237-45.